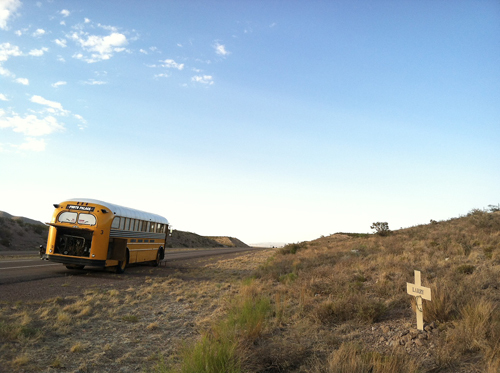 About the Rainbow Gathering and its relevance to The Photo Palace Bus. I thought I'd indulge those who have been following this blog with a little information about the Rainbow Family and its Gatherings, which have been a big part of my life for the past 15 years. My first exposure to this cultural movement came in the spring of 1997 when Melinda, my classmate at Palomar College, took me to the desert east of San Diego to a Regional Gathering. There I saw a group of about 3,000 people camping under the stars, sharing food and drink, making art and new friends and having a peaceful co-existence based on mutual respect and love. I knew that I was in a different kind of environment when, after parking in a large open space among other dusty vehicles, Melinda jumped out of her open-top Jeep without taking off the faceplate of her CD player (remember those?). I alerted her to that fact, thinking that she had simply forgotten to do so, to which she simply said that "you don't have to worry about those things in this place". After setting up our tents in a soft sandy wash we walked to a makeshift kitchen built of twigs. There we were greeted with hugs from strangers and kind words that made me feel like I have found a place I belong - "Welcome Home!". We waited for the food to be prepared and then joined hands in a big circle before sharing the bounty of a good hearty meal. At night we drummed and danced around a heart-shaped fire pit about 20ft in length, walked around the desert assisted by the light of the full moon, talked to people from all over the country and the world, learned songs around small campfires and meditated on the beauty of our surroundings. The days were filled with learning crafts, helping the new arrivals with their gear, trading goods (there is no monetary exchange at The Rainbow) and being genuinely happy and carefree. We spent a week and a half surrounded by beautiful people, who did not pass judgement based on who came from there or what they did for a living. After leaving the desert I was a changed man (boy really, as I was only 19 at the time) and knew that I wanted to be a part of this movement of free-thinkers for the rest of my life. This experience also convinced me that I should follow my dream of becoming a photographer and when I returned to San Diego I decided to switch my major from chemistry to photography. When the summer came around Melinda bought three bus tickets for herself, her boyfriend Ryan and me to northern California. From there we hitchhiked around the west coast for about a month while waiting for the National Gathering, which that year was held in central Oregon. The fun we had and the unplanned circumstances that led to me hitchhiking by myself are best left for a memoir as they would take too long to recollect and go into details. Let's just say that in mid-June I found myself at The Rainbow in a place called Bus Village. There was a large number of RVs and buses there including some extraordinary contraptions like buses with cars, other buses, boats and airplanes mounted on top of them. One bus parked close to where I was camping next to happened to have a glass-blowing studio built in and THAT is when I got infected with the idea of building myself a bus with a darkroom in it in order to satisfy my new-found love of traveling with my old love for photography. Every year since then I have made pilgrimages to the National and Regional Gathering in US, and even was lucky enough to make it to one Regional International Gathering in Baja California in 2008. Every year I learn more and more about the inner workings of the Gatherings, problems that plague it and the people who make it as beautiful as it really is. Truth be told that everyone may and will carry out their own unique experience after attending these events - you reap what you sow and so negativity will find those who thrive upon it and beauty will follow all who unconditionally carry it within their hearts. The people I met there became some of my best friends (even if, unfortunately, I may only see them once a year) and I truly look forward to seeing them again in a few days. 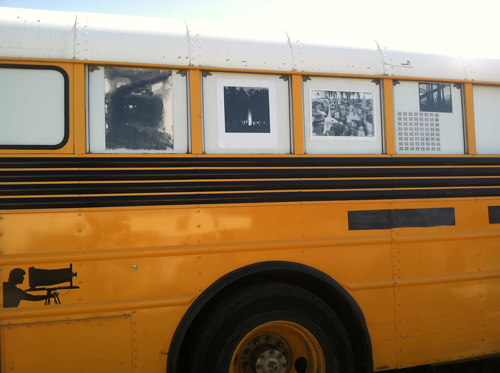 The Photo-Bus idea was going in and out of my main focus in life for about a decade. In the meantime I kept collecting darkroom equipment, cameras and knowledge. In 2006, after completing my studies at San Jose State University, I met a freshman by the name of Ryan Kalem while being in the darkroom and pouring over my negatives brought back from that years National Gathering in Colorado (National Gatherings are held in a different state every year). He was intrigued and I promised to someday take him to a Gathering. That had to wait until 2009 New Mexico Gathering. On our way back I shared my idea of a mobile darkroom with Ryan. 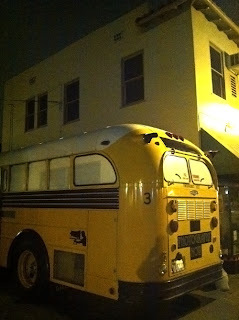 He got very enthused about it and we decided to build the Dream-Bus after he graduated from SJSU. I started saving funds as I knew that this project will take more money than I have ever had in my life. I got a job as a photographer at Carvin Guitar Corp. and opened a darkroom in San Diego where I rented work space and taught traditional photography in one-on-one setting. Meanwhile Ryan was looking at various buses for sale on the web and finally found our Gilli in August 2011. Luckily, by that time I had saved up just enough to be confident that I can see this project through and with no second-guessing decided to plunge head-first into this venture and here we are now - on the road and loving it! That, my Dear Reader, is how an alternative counter-culture of free-thinking radicals that call themselves Rainbow Family inspired the building of the only full-size traveling darkroom currently in existence. This is also the reason that I feel that by making the first prints AT and ABOUT the Gathering would be a perfect continuum. I can not wait to walk into the woods of Tennessee and see familiar smiling faces, feel the hugs and say "Welcome Home" to the elders and newcomers alike. All are welcomed there as long as they show respect for themselves, others and nature. The Image below was created on 4th of July 2009 in New Mexico after one of the most beautiful rain storms I have ever seen. Hello to all my diligent readers. I feel like I've been away from here for too long and a lot has happened. 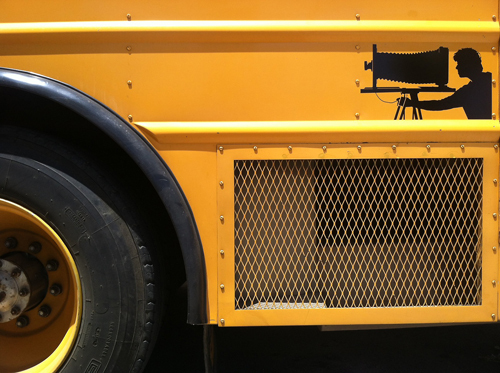 First off - the graphics has finally been put on The Bus and here is a little preview of it. Thanks to Craig King for producing the vinyl on the fly and coming down to North Park all the way from Vista (which is about an hour away) to help with installation. I'll give You a more detailed look at it all once it's all Really Done. Here is a picture of The Bus parked under my darkroom in San Diego, which is where 95% of the equipment for The Photo Palace Bus came from. Loading up equipment that I have collected for this exact purpose was a really emotional experience for me personally - it was most gratifying and thrilling as well as very difficult because I had to weed out all but the very essential things to take on the road. Apparently I collected quite a bunch of stuff that would be enough to outfit at least two full-size darkroom buses with no living space. Ryan and I worked late into the night. Let me say that the fact that this years National Rainbow Gathering is in Tennessee is really throwing a monkey wrench in our travels by sending our travel path through the hottest part of the country in the middle of the summer. 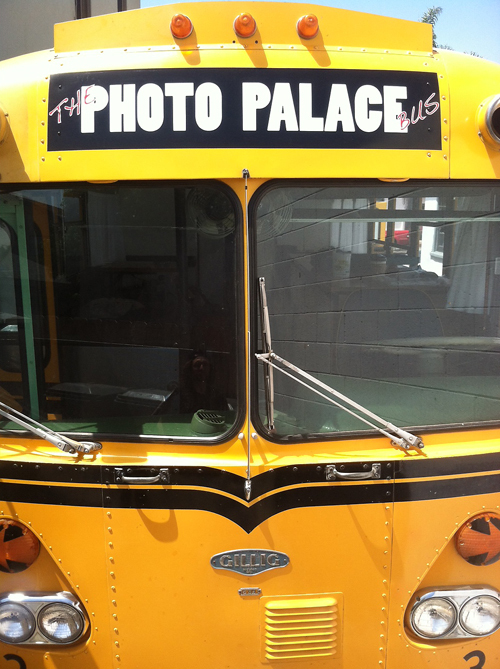 I am not at all regretting that I am trying to make it there as my first Rainbow in 1997 was indeed the birthplace of the idea for The Photo Palace Bus, except I had no idea back then that it will turn into an educational 'palace' vs. just a rolling personal darkroom. Since '97 I have only missed one Gathering in '99 and to this day regret not going that year (though I did hear it was miserably rainy and muddy in PA '99, but still it would have been a great under-tarp Gathering). Our route is going through AZ, NM, TX, OK, AK and TN and so far the temperatures in AZ and NM have been around 99-110°F (37-44.4°C) and we have been REALLY regretting not making Air Conditioning a priority #2 right after the actual darkroom part - film, paper and chemistry are overheating and so we bought an extra cooler for 8x10 and11x14 paper and are contemplating making another cool box for 16x20 paper and some chemistry. Thank god I brought some Kodak Anti-fog No.1 tablets as well as some pure Benzotriazole, plus a lot of Lith developer, which may take a lot longer to work with, but it's going to be totally worth it. So... Day 1 (june16th) went off without a hitch - we blew through more than half of Arizona state during the night and then stopped to give Gilli her rest during the hottest part of the day. It saw scorching hot and Ryans cigarette lit up by itself as soon as he stepped out of The Bus into the sun (well, not really, but it sure felt like every object including us was in danger of self-combustion). I tried to sleep on the bench, but kept being awoken by drips of sweat running down the sensitive parts of the body. At night we started driving again and that began Day 2, which was a lot more trying. to American Pride towering above us. Apparently we were at the Historic Native American Trading Post located just a few miles from the Continental Divide. It was pleasant to look around across an abandoned lot that was once a bustling place of commerce, but the sun had risen and was heating up the environment by what felt like 1° a minute. 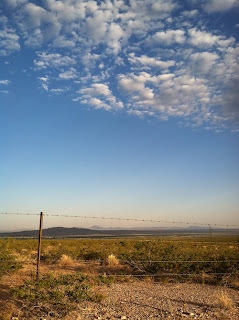 We took off eastward hoping that by some miracle the next truck stop we saw had a repair shop that could fix Gilli up. There was indeed a truck repair shop withing 40mi of us, but it took us over an hour getting there as Gilli-bus was not having a good time. I admit to having as little knowledge about diesel engines as I do about rocket science (I'm working on the first right now), so Ryan and I were preparing ourselves for the worst - what could it have been? Fuel or oil pump? Engine problems? Who knew.... Well, the first mechanic we came upon didn't know either, so we were sent another 60mi down the road to the Peterbilt Truck folks in Las Cruses, New Mexico. Apparently the spirits of car repair realm were being kind to us that day and we got off super easily! It was apparently a super-clogged first fuel filter. Gilli has two of them and the one that is apparent we did switch before the drive, but the other one was not even identified by the one mechanic that sis take a crawl with us under the bus when we were in CA. We got out of the repair shop for a meager $141.00, which included re-mounting one of our outer rear tires so that the one behind it is accessible for airing up (appears that it was mounted wrong the last time that the tires were changed by the previous owners). Unfortunately we also gained the knowledge that due to the bus having been sitting for the past 10 years without seeing much driving at all the diesel tank is now full of contaminants and needs to be flushed out - that's going to cost us $1K someday when we have the funds, until then we'll just have to keep switching out the two fuel filters more often than ordinary. To confirm the repairs we took a quick test-drive and, after taking a wrong turn, found ourselves inside the local dump-truck station at the exit of which was a scale that weighs the trucks on their way out. Overjoyed with that coincidence I asked the window attendant about our gross weight and was glad to find out that we weigh in at 24.640lbs - that's way below our maximum recommended weight limit and that's great news. After the repair shop we headed north (decided to skip the Gulf Coast due to time-constraints) to visit my good long-time friend Josh who lives in Belen, NM on a small farm. It was HOT and Gilli had to make it up and down a lot of hills... I was pushing her pretty hard because with the new-found agility Gilli was easily getting up to 60mph and she hadn't done that since we first got her. Unfortunately that eagerness to reach Josh and to get into an air conditioned room resulted in our first overheating experience... Gilli did behave exemplary - the thermostat kicked in at the right time as it was meant to do, the warning light came on and the engine shut down allowing us to once again crawl off the highway right by a memorial cross at the spot where someone named Larry apparently lost his life a while ago (in US people mar spots of accidents with make-shift crosses and New Mexico highways are long a windy so they are lined with these sad reminders of these tragic moments). We had a spectacular view to watch the sunset from. To the East there was just as open and beautiful view, but while trying to walk there I was quickly reminded of the thing that I noticed first after arriving in USA as a teenager - every road, no matter how far and desolate has at least one barbed wire fence running alongside it to remind the traveler that 'this land is NOT your land, this land is MY land, so please stay OFF it, or I will shoot You'. That reality made me a bit sad as I was used to land being public property in Soviet Russia. As a kid I enjoyed camping with my classmates and we were able to pick ANY random route through the forest on a map, go there on a train and we would not have to worry about encountering barb-wire fences unless it was around a military compound (and those we knew better than to try climbing)... Here's a shot of yet another wonderful stretch of land that nobody but the select few are able to access. We arrived to my friends house late at night and after some catching up we fell asleep in a quiet field next to a horse, miniature horse, 6 dogs, a cat and a lot of chickens and a rooster who woke us up at about 5am. We spent today parked in this field while being treated to cold sodas and working. Josh had a house guest at the time of our visit - another decade-old friend of mine Derek Goodwin. Both of them are very creative people and make art in their spare time. Anything from tattoos to paintings to sculptures. We visited a beautiful garden that houses a lot of their installations and I took a couple of pictures in front of an awesome butterfly sculpture that has a chopped up satellite dish for wings and an ex-military contraption for loading nuclear warheads into the rockets - I think it's a wonderful thing when artists transform things that used to bring fear into peoples life into something beautiful and inspirational. Looking forward to developing and printing that image soon. One important thing that was accomplished was outfitting of the windows with images - about half of them are done and the rest may have to wait until there is actual printing done on the bus. For now I put 20x20 fiber base images from Guatemala 2006 on the left side and an assortment of 5 images done with various techniques on the right side. 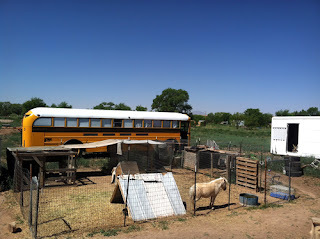 We still have 7 more windows to fill, plus one more on the right side that we are reserving for possible future advertisement by any companies or individuals that may want to sponsor The Photo Palace Bus on continuous basis in some capacity. Well... I think this had been an extra-long post and the temperature outside has dropped significantly in the time that it took me to write that. We are off again to drive through the night. I promise to take it easier on Gilli and not let her get above 190°F, which is her ideal operating temperature. We should be able to make it to Texas panhandle by the end of the night. Next stop - Oklahoma. There we are picking up a friend of ours who is one of the folks who made it to the very first Rainbow Gathering in 1972. Rick is a great guy and we are going to bring him Home (which is what we call The Gathering) this year. Can't believe he was thinking of not going this year - it's only 2 states away from his house, for Pete's sake! I'll cut him some slack though - as a senior citizen traveling 700mi alone is not too much fun, that's why we talked him into going with us. Hope everyone is having a good Summer. Remember, tomorrow is a BIG DAY - by that I mean the beginning of Summer Solstice - the last Summer Solstice before the change of the Mayan calendar in December. 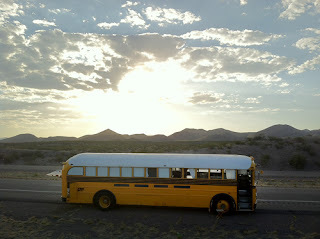 We will celebrate by greeting the sun on the road as it comes up and doing some sun salutations in its honor. Lat few days in San Diego have been filled with preparation for the departure, which at this point is roughly scheduled for Monday, June 10th. Knowing that this date is coming up is a bit nerve wrecking because it seems that there is still a lot to do. 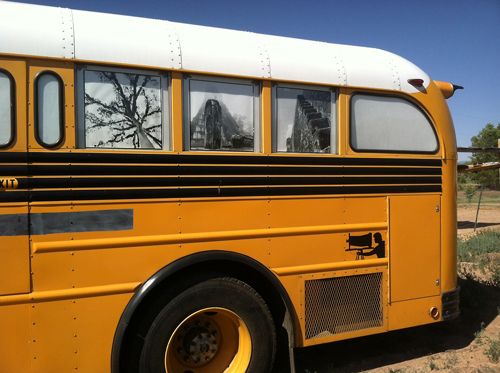 The windows still have to be outfitted with display imagery, graphics need to go on The Bus to identify and distinguish it on the road, the bathroom needs major work (though that can be finished on the road), loose wires need some attention, etc., etc. As I am writing this Gilli The Bus is being worked on by professional mechanics of San Diego Freighliner. in preparation for the road she's having her shocks and belts replaced along with one of the pulleys on the wonderful CAT engine, and getting all lubed up with a 20-point lube job. In fact they called about 2 minutes ago and told me that one of the plates that hold the shocks is cracked and has to be welded together... This is definitely going to set me back quite a bit in terms of finances, but it is important to maintain the moving part of the art. However, I believe it is possible to to do all this and still have time to visit my old stomping grounds, Ocean Beach, CA, and hold the first guerrilla portrait session right by the beach. It would be a perfect place to start from because the town is located at the very end of highway 8, which runs East and will be our first, and hopefully hardest, leg on our first voyage. Also, Ocean Beach is a quaint little community full of independent thinkers and that is where I spent a lot of time in my youth, surfing and daydreaming of someday having a mobile darkroom while being gently caressed by Pacific Ocean waives. History is cyclical, so I feel compelled to follow suit. It has been a LONG time since I made a print in the darkroom (two months is a long time for me...) and have recently felt like I'm being trained for a new career in construction and design. 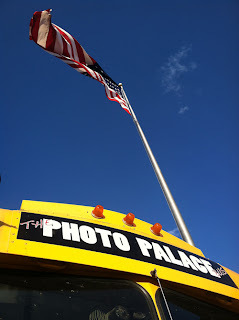 Based on that the first mission of The Photo Palace Bus will be decompression and art creation (art creation will of course remain a central theme past the decompression faze). I look forward to the open road and being guided by intuition and light. 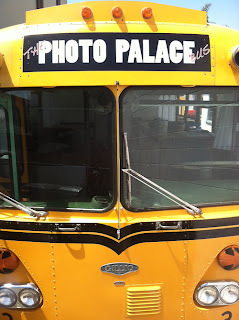 The Photo Palace Bus is, of course, still open to invitations for specific and non-specific events. If You have an urge to see TPPB in your neck of the woods - contact us and it will be arranged. While thinking of this, please consider that it would be ultra-nice if The Bus arrived to a reserved parking spot we can count on(Gilli is 35ft long and she requires ample room for turning around). Otherwise we can visit You for ANY reason - hold a portrait session in Your town, do a small art show of hand-made prints (vintage and contemporary), give a demo to a local middle or high school or to a few more advanced photographer who, perhaps, have never had a chance to work in the darkroom, but have always wanted to.... Possibilities are endless! I we would also stop by if you just want to say hi and show us your favorite place to eat (nothing like tasting the flavors of local cuisine, I'm personally looking forward to some good soul food when in The Gulf area). Otherwise our route will be VERY roughly announced probably the day before we leave. You can assume that we will be traveling East pretty quickly, trying to get to the coast - AZ , NM and TX have temperatures above 100°F currently and we are rolling with no AC on board. I can, however, tell You what the first scheduled stop is as we stand right now - Tennessee! You may ask - why TN? The answer is simple - that is where this years US National Rainbow Gathering of the Tribes of Living Light will take place (long, and perhaps too official-sounding name for a completely anarchistic grass-roots movement...). As some of my readers may know I have been going to this event every year since 1997 (missing one year in 1999) and that is where I draw a lot of inspiration for my daily life. It is a place from which anyone and everyone who comes may and will carry away different experiences depending on the energy they bring to contribute. It is a place where I feel I have created some of my best imagery, though that will be for posterity to decide. More than that, it was at my first Gathering in Oregon '97 that I was impregnated with the idea for The Photo Palace and every year since, while making my way to various states where it's been held, I imagined myself one day pulling in with an actual studio and darkroom. At the Gathering I am looking forward to offering free photo workshops, holding family portrait sessions and making prints while listening to the distant sounds of drumming. I have done that through the years, but on a much smaller scale - every year I came with 100 to 300+ gelatin silver 8x10s from previous years and giving them to people who find themselves in the photos, in 2002 I managed to bring enough equipment to be able to produce cyanotypes on the same day using Polaroid 55PN film (and give those away to happy participants and models), and in 2009 I offered a portrait and photography workshop and had one extremely dedicated student who got a tremendous crash-course covering everything from film speeds and grain structure to 4x5 movements and history. The Gathering happens from mid-June to mid-July with 4th of July being a day of silent meditation on Peace. Assuming that Gilli will behave and the time-table is kept intact, The Photo Palace Bus should be leaving TN around June 6th and heading to the Atlantic coast and then up to Maine. Then it's a long journey back to San Diego, but I hear they play baseball all along the way, so it shouldn't be too bad, right? I actually have done that drive in 1998, coming back from Limestone, Maine (Google it, it's pretty much the furthest point north-east you can go and still be in US, while being surrounded by Canada) and it wasn't so bad. In fact it was beautiful and I look forward to doing the same trip in a much slower fashion that will allow for more artistic bonding with the landscape and people along the way. Well, a lot of work is still ahead and this post is turning into a short novel. 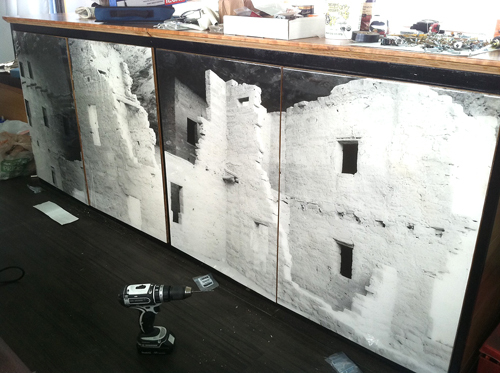 To reward those who at least scrolled though it all to the end I am going to show You a quick shot of the counter as it looked in the short amount of time that the doors were on it, but the little silver handles were still not drilled into the images. I battled these doors quite diligently. 2-part epoxy is a major pain in the neck and, not having ever before worked with it on any scale, covering large mural prints was a challenge. The trick is in the mixing the two parts in equal amounts and if even a tiny bit is not completely evenly mixed almost on the molecular level you have a 99% chance of LOSING your piece of art FOREVER! At least that is what I was told by a couple of more experienced folks after my first attempt failed spectacularly. The news did not sit with me well at all! I put about 2-3 hours worth of printing time into each of these prints, they were printed at a facility that I no longer have full access to, and they were printed with developer that is no longer made - and in edition of 1 40x50in each! So I was not about to give up. I bought more epoxy and proceeded to pour more layers. That worked to a degree (three of 4 came out from the second time), but on one of the doors I had to pour again, making that one have three layers of this stuff, which actually makes that one look the deepest and slightly cooler. Now all is left is one door (which is a whopping 19x40in while the 4 doors in the picture are 22x30ish), Ryans cyanotype leaf - I already struggled with it twice and I think, if he helps me this time, I can finally cover all the blotches that are still not set. So - here it is Presentations Counter With Doors! Well, I'm off to do some writing for the upcoming website content and to daydream about things that the road may hold in store for the near future. BTW, for those of You who work and don't enjoy it - the weekend is almost here! Plus I hope You find Zen in your existence sooner than later and then it's not going to be such a drag at all. For those who work and enjoy every second of it - good for You! For those who don't work and enjoy it - congrats! For those who don't work and don't enjoy it - hang in there, I hope something good is right around the corner for You.